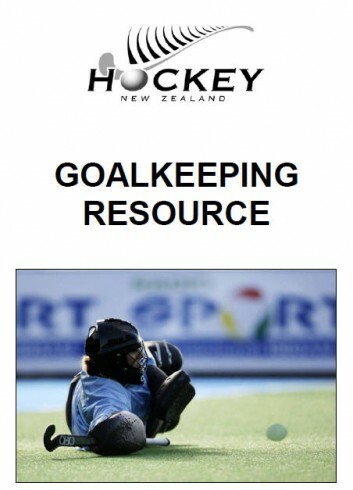 Here is a great Goalkeeping manual in PDF format produced by New Zealand Hockey. You will need the free Adobe Reader to open the PDF. .
Lateral movement (side to side) is the key area of movement around the circle. Think of your movement area as a mini semi-circle of the larger D you play in; this is the space you need to cover to protect your goal. By moving sideways, you can change your angle against the opposition; moving across to deal with the new attacker as the pass is made. 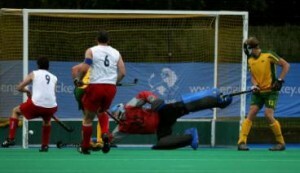 Shuffling is the essential form of movement for a goalkeeper to move across the face of goal. If you watch soccer goalkeepers, the move is very similar; basically, it is sidestepping across to the side you wish to move to. When pushing across from the pushing foot (depending on your left or right direction), make sure your keep in your ready stance, holding your hands up ready for a shot. 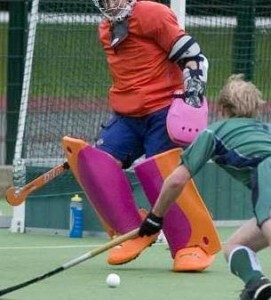 With the shuffle opening up a large space between the open legs when moving, a lot of keepers (up to the pros; Stephen Lambert is a good example, and you could find footage of him actively doing this, playing for Australia in the recent Olympics). This closing off of open space when moving makes sure you have no space showing, in case of a shot; when facing a screen or in-close action when facing goal mouth scrambles, or when facing a deflection as you move across goal – more important in higher levels when shooters like to go for this area, as it is easy to expose. When pushing across, lead the back leg into the lead leg, in order to close gaps by pushing to lock the pads together, or be as close as possible to block. This extra coverage against shots, with the security of no gaps. However, comes at the cost of movement (since it slows you down when moving to force your legs together, which can be costly when moving with speed against the play is vital). So if you’ve got to dash across the D to get back into space, then you have to balance the importance of speed, by ignoring the need to cover gaps and sacrifice coverage for extra movement. Next came the most painful and bloody part of the modification, yes ladies I can sew 😉 I’m domesticated. I didn’t want to write this review as part of the competition as I kind of see it as more of a rant than a review, but hey enough talk time to stop boring you people. Right well it all started one training session when I coped a rather nasty shot on my right shoulder, the body armour did it’s job of protecting me from serious harm. However I started feeling more and more uneasy with shots in the shoulder region to the point of flincting when a ball went there. Fearing that I had lost a lot of confidence I decided to try other brands of equipment in shops to see what felt better and a bit more solid around the shoulders. 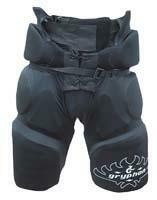 I was amazed to find that nothing on the market at the time had solid shoulder protection. I found my old ice hockey style protector (mercian shoulder caps) and thought “hey I wonder how they would work together.” Safe to say having both on was silly. I then decided modification was the key, I then chopped off both shoulders of the Robo armour and carefully removed the shoulder caps off the mercian shoulder caps. I then removed the hard protective foam across the top of the remaining parts of the BA, making the BA look like a vest haha. Next came the most painful and bloody part of the modification, yes ladies I can sew and I did sew the mercian shoulder caps on to the BA. Looking rather messy I made some covers for the shoulders which I later removed cos they was PANTS! The last thing I did was resew the arm attachement velcro or whatever it is to the shoulders to allow the arms to be attached again. I hope I entertained you for a small amount of time, or if I bored you sorry, but you could have clicked off! Here are some links to pics of the BA. Just to let you know I now no longer use the BA but my good friend and back up keeper is wearing it and believes its the best thing since the pull cap on baked beans. I hope that the new generation of OBO Robo Armour can be reinforced up in the shoulder department. Anyway take care and happy keeping! At 1st after a few practices with it i really did not enjoy using it , i am a keeper who likes to slide and am rather agressive. the glove made slide takling with the stick hard and logging. 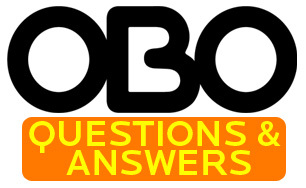 That all changed after a went onto the obo site and wached some video’s or was it looked at some pictures( it was a while ago) and they explained how you need to change the style of play for this little beauty, i also found out that the inner pieace right by your hand can come out. the glove works just as well on the ground as the hi-control, but it also has the hi-rebound characteristic. 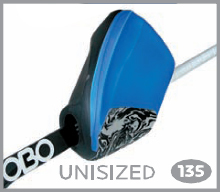 its also alot larger and on a few occasions has helped me make some awesome top right drag saves. The glove may be large but its not a replacement for the LHP as you dont have as much controlle and you feel a hard hit ball through it alot more than the left, having said that it comes in handy (no pun intended) for those quick reflex saves. ITs a very durable glove too iv had it for 3 yrs of constant battering and only now has the top opening started to tear. easily fixed with some glue though . In generall its an awesome piece of kit, it takes some getting used too ,but once you know how to handel it it works really well and i more than happy with it. Tom’s hockey is continuing to go well – he is now 19 and studying Actuarial Science at the University of Cape Town and playing in their 2nd side. Both 1st & 2nd sides play in the Grand Challenge league, which is probably the strongest league in South Africa so he is gaining some valuable experience. He is need of a new stick now. He has been using what I reckon is a predecessor to the Skinny, since age thirteen and it is finally now cracking slightly. I think he should go for the Fatboy this time. His recent ability and confidence on his stick side has dropped slightly – last year it was stronger and he is trying to work out why this could be. I read a couple of information sections about the merits of the Fatboy and the Skinny but I wondered if you could suggest which to go for? Tom is physically quite strong and is about 6 feet 1 tall. I see there are two sizes 36.5 and 37.5 available – I presume that 37.5 would be best for him? Any suggestions or advise would be much appreciated. Moving around your D is just as important as controlling it; if you’re not moving into position every time the ball moves, you’re not going to be into position to make the save. Shuffling is the main vehicle for moving around, for sideways movement across the D and between attackers, but don’t rule out running sideways, backwards or forwards – how else are you going to charge down the shot, or rush back to fill up space? To be able to react to the play’s development and be ready to make an immediate save when called upon, you have to constantly be moving with the play itself. With the change in pace and direction, you have to be adapting your position to match. If you are not and caught unawares, you make the opposition’s life all too easy; not being set on the angle and leaving a wide open net to shoot at. 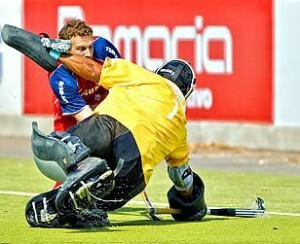 Moving constantly to re-position in the arc (that has been talked about in previous articles; http://blog.obo.co.nz/2009/05/18/the-arc-around-goal/) will dramatically improve your shot stopping and ability to play the angles to your advantage, instead of being forced into a difficult save as the ball moves into the open space you were not ready for. You can arrange your movements by where you are in relation to where the ball is; moving with the ball to keep up with the scoring chances and angles for incoming shots. Your head should be on a swivel, constantly checking to see where the ball is, in case a long pass or run has been made, and then moving your body to adapt to the change in play; kind of like a turkey in a farmyard! When the ball gets past your half way line you can relax, but once it’s over the line and an attack can easily appear out of nowhere you need to be ‘switched on’ and alert; ready to spring into action.